A business plan lays out the structure and marketing strategy of a company. It usually states where you want the company to be in three to five years and explains the setup, staffing needs and, most importantly, startup costs. The majority of loan companies will ask to see your business plan before providing funding. 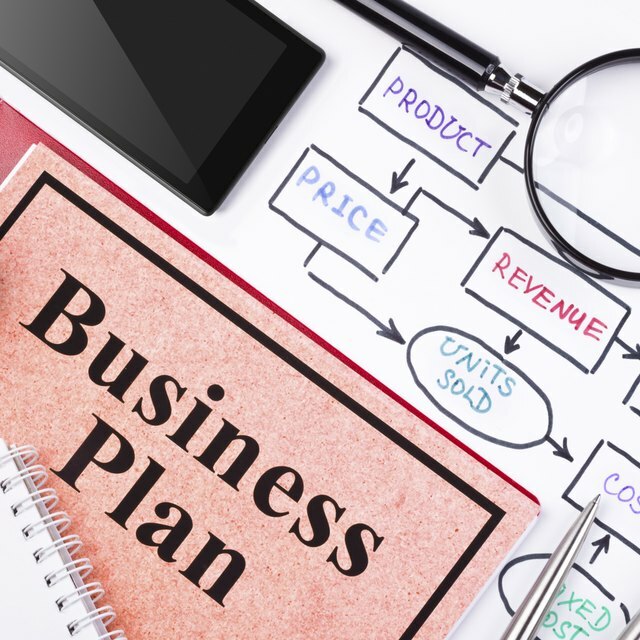 A simple business plan is thorough but concise and written in easy-to-understand language. There is no right answer to how long a simple business plan should be. "Brief" and "short" are subjective terms when it comes to writing this document. Entrepreneur Magazine suggests no more than 20 to 30 pages of text plus an additional 10 pages of projections. Any plan over 40 pages is probably too long. Don't mistake a simple business plan with a one-page business plan, which does not contain enough information to get funding from a lender or investor. However, a one-page plan is a good guide to keep you on track and is helpful for explaining your company in a one-minute sales pitch. Bar charts are suitable for showing sales and profits. Pie charts provide a clear image of market share -- how much of the market you've cornered. Gantt charts are helpful for describing milestones. Entrepreneur Magazine suggests making your business plan "inviting." Incorporate white space, such as double-spacing between single-spaced paragraphs. Keep your font size at 11 or 12 points. Proofread to remove every possible error. You can break some elements of the plan into subcategories, or you can give them their own sections. For example, your market analysis could include your marketing plan, or your marketing plan could stand alone. The executive summary provides a succinct, overall description of your company and why you’re in business. Include a description of your products or services and how your company fits into the market. Explaining your financial growth — profits and return on investment — is also a critical element. Most executive summaries list the names and biographies of key staff members, including owners and leaders, although sometimes this information is listed in the business description or a separate operations section. If this is a new business, focus your executive summary on the gap in the market and how your company is the one to fill it. End with information about how you expect to grow in five years. The business description provides more detailed information about the structure of your business and its products or services. Describe whether your business is a sole proprietorship, partnership or a corporation, as well as the type of business. For example, you might be in manufacturing, food service, retail or some other type of service area. Explain how you will gain a competitive advantage, such as a unique product or a better customer service model than your competitors. Most importantly, describe how you plan to increase profits with your investors’ money. Some businesses address the amount of funding they seek to borrow. Others include this information in the financial projections section. The market analysis contains an in-depth analysis of your market research, including sales revenue of competitors and the needs of your customers. Study various economic indicators and wage data for a thorough analysis. Support your conclusions with research in trade publications and business magazines. Entrepreneur Magazine offers many tips to researching your market. If you're a startup, learn about the saturation level of your market and if you can reach that market. For example, if you’re selling a top-of-the-line widget, you must assess if you’re located in an area with residents who can afford them. Find economic information at the U.S. Census Bureau and City-Data. Use your analysis to create a marketing plan, where you describe how you will promote your business using print and electronic advertising. The financial projections section contains a historical account of past financial performance and your company’s projected financial performance. The Small Business Administration states that most investors want to see financial statements from the previous three years. These include balance sheets, statements of cash flow and income statements. For your projected income, provide projections for the next five years. This takes into account the cost of operating your business, including overhead and cost of goods sold. The more thorough your market research, the better you can project sales. FindLaw offers tips on how to effectively write your financial documents, including balance sheets and income statements, also known as profit and loss statements. Your conclusion should wrap up your business plan on a high note. State your confidence in your business, and assure your investors that you will make money. Not all business experts advise a conclusion, but those that do, such as Partec Consulting Group, remind you to include your contact information and invite interested parties to contact you with additional questions. Don’t forget to thank your readers at the end. Business Plan Template offers free templates of business plans for varying business types. The "Retail Store Business Plan" contains especially clear sections.